If you have served National Service you would have heard the difference between entitlement and privilege a lot. Entitlement would be defined as your right, for example, you work overtime for some event, so you are given an off day to compensate for that extra time you worked. You can’t be denied that off day, it’s yours. Privilege is something you don’t deserve but you are given, a form of benefit which can be taken away. We have all heard before that Singaporeans have this entitlement issue. We think that there are things that we deserve because we pay for them and this makes society very demanding. Have you seen the elderly approaching people for seats? They feel that because they are old they deserve seats. Is that the way this should be? Every commuter on the train or bus pays for the transportation and all of us have the right to a seat. However because of the priority seats being marked out for them, they think that they are entitled to those seats and when people do give up those seats to them, how many of them are actually thankful? I have observed these elderly and there are some who take it for granted that people will give up those seats to them. It is even worse that the elderly think that the young people are obliged to give up their seats just because they are young. I was approached on the train to give up my seat (not a priority seat) by an old man who was seemingly fit enough to stand. I was previously sleeping and had just boarded the train one stop ago, on my way to school, a good twenty stops away. I gave up my seat but after that I wondered why he approached me. Those sitting on the priority seats weren’t exactly old. I could only come to the conclusion that he expected a seat from a young person. When were the elderly entitled these things? What made them feel it is their entitlement? People seem to think that as long as you pay for something, you are entitled service. In Singapore it is more so because of the presence of GST. We don’t pay GST for nothing right? That’s where we are wrong. In the retail industry, service is originally meant to be something extra that value adds to the store and gets customers coming back for more. It should be the product itself that draws us to the shop. Ever had good food but the service wasn’t good? By service it could mean the time it took for the staff to attend to you because of huge crowds. You don’t see people turned off by that right? After all good food is worth waiting for. We shouldn’t feel that we are entitled to good service. If there is no good service, yes, we may end up considering not going back or not getting that product we were interested in but we should understand that it is not something that is always available. Photograph of an unhappy diner who poured unfinished food on the table at an eatery after the food and service was not to his satisfaction. In Singapore, this entitlement mentality can be observed in areas such as education. When we are young as kids, we see education and school as a dreary on the most part because of the homework and heavy workload that increases as we further our education. We feel that as long as we score well for our exams we will have a school to go to and we have the right to continue schooling. Think about it for a moment. There are lower income families who are struggling to pay for the school fees for their children. There are children who are deprived education in other countries because of social or socio-economic factors. Do we take this right to education for granted? We have so much complaints about school as students but how do we prioritize our responsibility as a student to study? We might consider it a chore in Singapore but there are places where children would love to study. How has our society become one that feels that they are entitled to so many things? 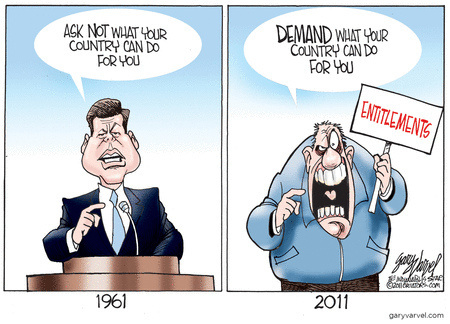 Perhaps this mindset is related to the high cost of living. With the high cost of school fees and other living expenses, it is no wonder that Singaporeans expect a higher salary in turn and also better service for the products they buy. 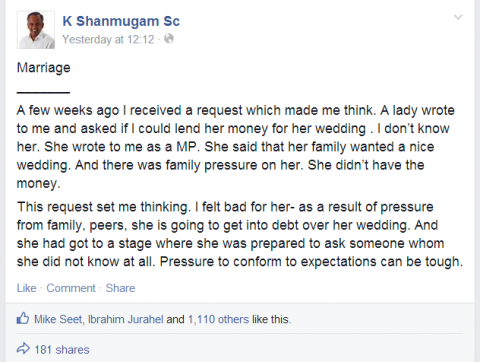 Recall the incident where a woman asked Minister K Shanmugam to lend her money to pay for her wedding? This shows us that as Singaporeans, what we feel we are entitled to is rapidly changing and becoming more ridiculous over time. Feel free to share with us your thoughts and feelings about this issue. Previous Post Singapore’s 1st and Only Collagen Hotpot Buffet – Only at Momiji Shabu Shabu!